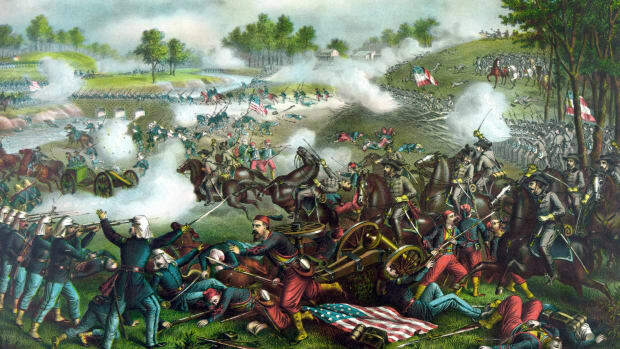 The Second Battle of Bull Run (Manassas) proved to be the deciding battle in the Civil War campaign waged between Union and Confederate armies in northern Virginia in 1862. As a large Union force commanded by John Pope waited for George McClellan’s Army of the Potomac in anticipation of a combined offensive, Confederate General Robert E. Lee decided to strike first. Lee sent half of his Army of Northern Virginia to hit the Federal supply base at Manassas. Led by Stonewall Jackson, hero of the First Battle of Bull Run (Manassas) 13 months earlier, the rebels seized supplies and burned the depot, then established hidden positions in the woods. On August 29, Pope’s Federals clashed with Jackson’s men, who held their ground with heavy losses on both sides. The following day, after the rest of Lee’s army arrived, 28,000 rebels led by James Longstreet launched a counterattack, forcing Pope to withdraw his battered army toward Washington that night. In July 1862, President Abraham Lincoln appointed Henry Halleck as the new commander in chief of Union armies during the Civil War, having relieved George B. McClellan of that command the previous March. To Lincoln’s frustration, McClellan was demanding more troops in order to renew his offensive against the Confederate capital of Richmond during the Peninsula Campaign. 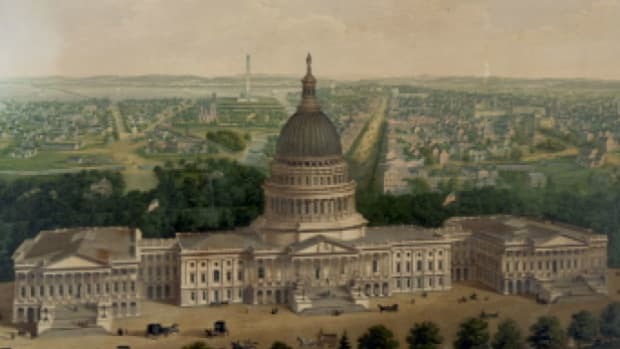 Lincoln and Halleck decided to recall the Army of the Potomac to Washington and unite it with the newly formed Army of Virginia, then under the command of John Pope, in order to make a combined offensive toward Richmond. Pope, who had previously made his reputation in the war’s western theater, was known for his tendency to boast, and was widely disliked among his fellow Union generals, including McClellan. Did you know? Union Major General John Pope lost about 15,000 men in the Second Battle of Bull Run (Manassas), along with his reputation. Relieved of command, he was sent to the Army&apos;s Department of the Northwest for the remainder of the Civil War. Knowing McClellan’s army was on its way to join Pope, which would mean an overwhelming numerical advantage for the Federals, the Confederate General Robert E. Lee resolved to strike Pope’s army before that happened. In late August, he divided his Army of Northern Virginia, sending half under Thomas J. “Stonewall” Jackson to the northwest to march around Pope’s right flank while the rest, under James Longstreet, watched Pope’s army across the Rappahannock River. Though Union scouts detected Jackson’s movement, Pope thought he was heading for the Shenandoah Valley. Within two days, Jackson’s army of some 24,000 covered more than 50 miles, striking the Federal supply base at Manassas Junction, some 25 miles to Pope’s rear. Though Pope then turned his army to confront Jackson’s assault, they could not locate the rebels, who had left Manassas Junction and taken up positions in the woods and hills a couple of miles from the site of the war’s first major engagement, the First Battle of Bull Run (Manassas) in July 1861. McClellan continued to resist sending troops forward to Pope’s aid, arguing that they were necessary to defend Washington. Meanwhile, Lee remained in contact with Jackson via cavalry troops led by Jeb Stuart. After a firefight between Jackson’s men and one of Pope’s divisions at dusk on August 28, Pope prepared his army overnight to mount an attack against the Confederates. Believing that Jackson was preparing to retreat in order to join the rest of the rebel army (and not realizing that in fact Longstreet was advancing to join Jackson), Pope did not wait to assemble a large force, but sent divisions in smaller assaults on the Confederate positions on the morning of August 29. Jackson’s men managed to hold their ground, turning back the Federal assault with heavy casualties on both sides. On the Union left, Fitz John Porter defied Pope’s orders to lead his men forward against the Confederates on August 29, believing himself to be facing Longstreet’s entire corps. In fact, Longstreet’s men did arrive by noon, and took position on Jackson’s flank. 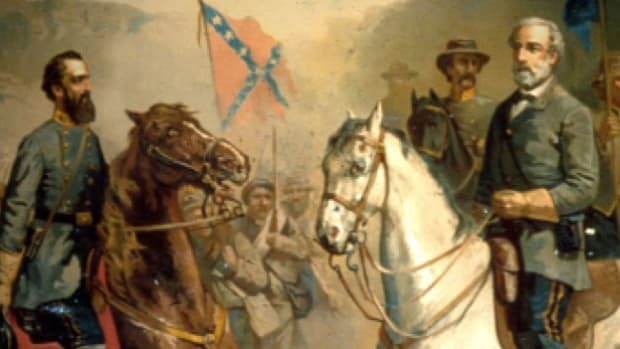 (Porter was later court-martialed and convicted for his failure to act, though the verdict was finally reversed in 1886 after captured Confederate documents proved that Porter had indeed been facing Longstreet’s corps.) For his part, Longstreet was intimidated by the unknown size of the Union force facing him (commanded by Porter and Irvin McDowell). When Lee suggested that he advance on August 29 to relieve pressure on Jackson, Longstreet resisted, insisting it would be better to fight on the defensive. When several Confederate brigades adjusted their positions that night, Pope mistakenly took the movement for the beginning of a retreat. 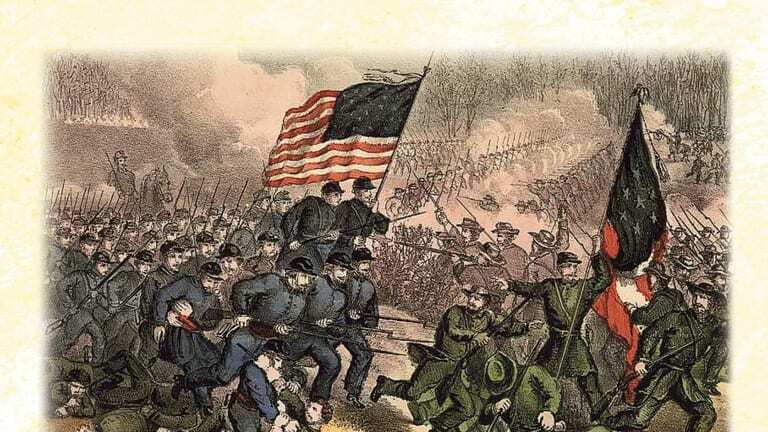 After sending word to Washington of an imminent victory and his army’s planned pursuit of the retreating enemy, he renewed the Union attacks on August 30. After Confederate artillery turned back a Union attack on Jackson’s positions, Longstreet ordered his corps forward in an aggressive counterattack on the Union left, which had been weakened after Pope shifted his troops right to hit Jackson. Faced with Lee’s entire army, the Federals were forced back to Henry House Hill, scene of the hardest fighting in the earlier Bull Run battle. That night, a crushed Pope ordered his army to fall back across Bull Run toward Washington. 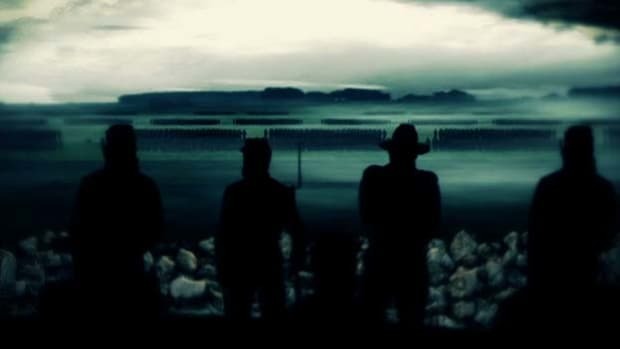 A wave of despair rolled over the North with news of the battle’s outcome, and morale in the army sank to new depths. Accusations flew among Pope, McClellan, McDowell and Porter about who was to blame for the defeat. His cabinet (notably Stanton) pushed for McClellan’s dismissal, and Lincoln himself had harsh views of the general’s conduct. But as McClellan had the unwavering support of the soldiers, and Lincoln needed a speedy reorganization of Union forces, he left McClellan in command. 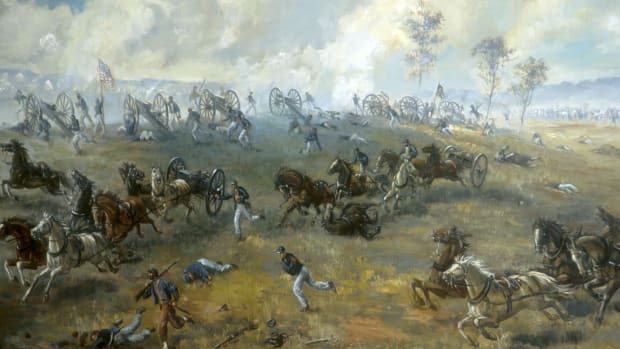 Despite heavy Confederate casualties (9,000), the Battle of Second Bull Run (known as Second Manassas in the South) was a decisive victory for the rebels, as Lee had managed a strategic offensive against an enemy force (Pope and McClellan’s) twice the size of his own. Pressing his advantage after the northern Virginia campaign, Lee launched an invasion of the North, crossing the Potomac into western Maryland on September 5. McClellan united his army with the Army of Virginia and marched northwest to block Lee’s invasion. 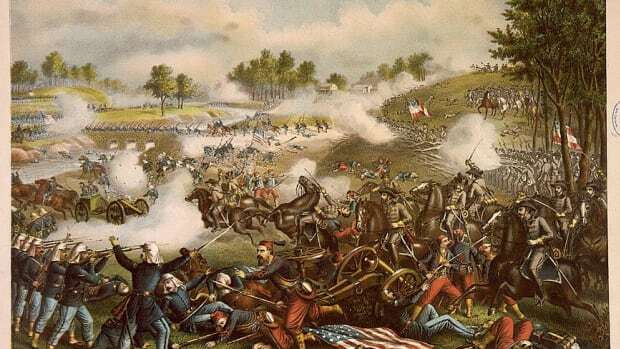 On September 17, the two generals would clash in the Battle of Antietam, the costliest single day of fighting in American history.